The Fantastic Voyage label has released some fantastic collections in recent times. Britain Learns To Rock is just one of them... and here's what I said about it on All Music Guide! "For someone like me, born in the early ‘60s, it was hard to imagine life without Rock ‘n’ Roll. I mean, just how did my parents enjoy a childhood before the rock revolution? And what kind of music ‘moved’ them before Elvis, Buddy Holly, Chuck Berry and the gang came along? As I grew up, my appreciation for pre-Rock era music grew and I began to hear the seeds of Rock ‘n Roll in old Country, Jazz and Rhythm & Blues records that I’d hear on the radio and in record stores I used to frequent. By the time I was in my mid-teens, I, too, loved the music my folks once called their own: Frank Sinatra, Bing Crosby, Nat King Cole, etc. So, in my journey through this big ol’ musical world, I began to understand and appreciate every type of music that came my way. I didn’t LIKE a lot of it, but I was able to understand its appeal. In a way, Britain Learns To Rock is similar to my own musical journey, except it plays out chronologically instead of my haphazard discovery of what made (and makes) Rock music so special. In fact, this collection should be required listening in any school that offers a music appreciation class. 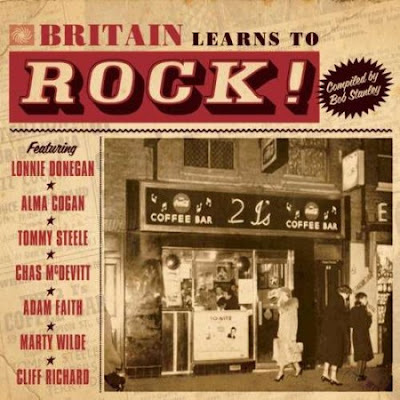 Beginning with the Jazz stomp of Ken Mackintosh, His Saxophone & Orchestra’s “The Creep” and the skiffle sound of Lonnie Donegan’s classic “Rock Island Line”, Britain Learns To Rock follows the early stages of England’s Rock ‘n’ Roll scene as it grew out of the smoky jazz clubs and morphed into something much bigger and far more dangerous. Taking their cue from the American Rock ‘n’ Roll scene, the British may have been a year or two behind and didn’t always get it right, but by the time Cliff Richard & The Shadows released “Move It” in 1958, those Brits were on the ball. Britain Learns To Rock was intelligently compiled and annotated by Bob Stanley (Saint Etienne), who certainly knows his stuff. And any compilation that contains cuts from Vince Taylor, Marty Wilde, Tommy Steele, Lonnie Donegan, Adam Faith, Jimmy Young and Alma Cogan is worth at least double what you pay for it!"